How to read this chart. 1. Maria Margaretha DOERFLER, born Abt. Jan 16, 1841 in Kandel, Pfalz, Bayern, (Bavaria, now Germany); died Oct 19, 1901 in Buffalo, Erie Co, New York. Burial: Buffalo, Erie Co, New York. Cemetery: United German and French. Her Tombstone Christening: Jan 16, 1841, Katholisch, Kandel, Pfalz, Bayern. Residence: Bet. 1896 - 1900, 102 Pratt, Buffalo, New York. She was the daughter of 2. Joannes Georgii DOERFFLER and 3. Odilia Caecilia STRITZINGER. She married (1) Johann Ludwig WINSTEL Apr 24, 1866 in Katholisch, Hayna, Pfalz, Bayern, Germany. He was born Abt. Aug 25, 1837 in Hayna, Bavaria, now Pfalz, Germany, and died Jan 04, 1894 in Buffalo, Erie Co, New York. He was the son of Johann Phillip WINSTEL and Maria Josepha WINSTEL. Baptism: Aug 25, 1847, Germany. Burial: Buffalo, Erie Co, New York. Cemetery: United German & French 186NN, Moest/Mary of Sorrows, Transf to 50KK May '99. His Tombstone Immigration: Apr 14, 1889, Sailed from Antwerp on Waesland, arriving in New York. Traveling with him was 'Marga, Josef, Louise, Caroline, Ludwig, Maria, & Elizabeth.' Note: Also listed as Joannes Ludovicus Winstel. Residence: 1891, Buffalo, NY city directory shows Louis living at 102 Pratt, occupation machine hand. 3. Odilia Caecilia Stritzinger, born Sep 15, 1809 in Hayna, Pfalz, Bayern (Bavaria, now Germany); died 1870. Christening: Bet. May 08, 1808 - Sep 16, 1809, Katholisch, Hayna, Pfalz, Bayern (Bavaria, now Germany). She was the daughter of 6. Joannis Jacobi Stritzinger and 7. Maria Anna Wingerter. 1 iii. Maria Margarethae Doerfler, born Abt. Jan 16, 1841 in Kandel, Pfalz, Bayern, (Bavaria, now Germany); died Oct 19, 1901 in Buffalo, Erie Co, New York; married Johann Ludwig Winstel Apr 24, 1866 in Katholisch, Hayna, Pfalz, Bayern, Germany. viii. Elisabetha Doerfler, born Abt. Apr 12, 1852 in Kandel, Pfalz, Bayern, (Bavaria, now Germany). Her christening was: Apr 12, 1852, Katholisch, Kandel, Pfalz, Bayern. 4. Christianus DOERFLER, born Abt. Jan 02, 1774 in Kandel, Pfalz, Bayern, (Bavaria, now Germany). He was the son of 8. Joanne Michael DOERFLER* and 9. Dorotheae WITTMAYER. He married 5. Anna Maria GLANCK Sep 02, 1805 in Kandel, Pfalz, Bayern, Germany. 2 ii. Joannes Georgii Doerfler, born Abt. Jun 14, 1810 in Kandel, Pfalz, Bayern, (Bavaria, now Germany); died 1868; married Odilia Caecilia Stritzinger Feb 07, 1836 in Katholisch, Kandel, Pfalz, Bayern. 7. Mariae Annae Wingerter, born Abt. Nov 17, 1783 in Hanya, Bavaria, Bayern, Germany. She was the daughter of either, Johann George Wingerter and Franziska Unknown, or 14. Martini Wingerter* and 15. Maria Eva Wingerter. i. Odilia Stritzinger, born Abt. May 08, 1808 in Hayna, Pfalz, Bayern (Bavaria, now Germany). 3 ii. Ottilia Caecilia Stritzinger, born Abt. Sep 15, 1809 in Hayna, Bayern, Germany Birth Record; died 1870; married Joannes Georgii Doerfler Feb 07, 1836 in Katholisch, Kandel, Pfalz, Bayern Marriage Record. iii. Joannes Baptista Stritzinger, born Abt. May 11, 1811 in Hayna, Bavaria, now Pfalz, Germany. iv. Joannes Nicolaus Stritzinger, born Abt. Aug 23, 1812 in Hayna, Bayern, Germany; married (1) Appolloniae Schlund; married (2) Maria Eva Baron Nov 05, 1833 in Hayna, Bayern, Germany; born Sep 13, 1809 in Hayna, Bas Rhin, French Republic. v. Barbara Stritzinger, born Abt. Oct 13, 1814 in Hayna, now the Pfalz, Germany. vi. Eva Margaretha Stritzinger, born Abt. Jan 21, 1817.
vii. Margaretha Stritzinger, born Abt. Mar 14, 1818 in Hayna, now the Pfalz, Germany. viii. Georgius Antonius Stritzinger, born Abt. Dec 07, 1819 in Hayna, Bavaria, Bayern, Germany; married Elizabeth Kuhn May 22, 1848 in Hayna, Bayern, Germany; born May 28, 1824 in Hanya, Bayern, Germany. ix. Catherina Francisca Stritzinger, born Abt. Jan 27, 1822 in Hayna, now the Pfalz, Germany. x. Maria Elizabetha Stritzinger, born Abt. Feb 08, 1824 in Hayna, now the Pfalz, Germany. xi. Josepha Stritzinger, born Abt. Nov 16, 1826 in Hayna, now the Pfalz, Germany. xii. Juliana Stritzinger, born Abt. Apr 12, 1829 in Hayna, Bavaria, Bayern, Germany; died Apr 15, 1897 in Pittsburgh, Allegheny Co, PA; married Jacob Keller Apr 09, 1850 in Pittsburgh, PA; born Jul 25, 1825 in Alsace, France; died Nov 07, 1905 in Pittsburgh, Allegheny Co, PA.
8. Joanne Michael Doerfler, born Abt. Aug 06, 1741 in Kandel, Pfalz, Bayern. He was the son of 16. Conradi Doerfler and 17. Nicolae Mueller. He married 9. Dorotheae Wittmayer Abt. 1767 in probably Kandel, Pfalz, Bayern, (Bavaria, now Germany). 9. Dorotheae Wittmayer, born Abt. Feb 15, 1739 in Kandel, Pfalz, Bayern, (Bavaria, now Germany). She was the daughter of 18. Mathiae Wittmayer and 19. Mariae Ursulae Unknown. i. Maria Barbara Doerfler, born Abt. Jul 18, 1768 in Kandel, Pfalz, Bayern, (Bavaria, now Germany); married Joannes Butscher Feb 13, 1792 in Katholisch, Kandel, Pfalz, Bayern. ii. Antonius Doerfler, born Abt. May 20, 1771 in Kandel, Pfalz, Bayern, (Bavaria, now Germany). 4 iii. Christianus Doerfler, born Abt. Jan 02, 1774 in Kandel, Pfalz, Bayern, (Bavaria, now Germany); married Anna Maria Glanck Sep 02, 1805 in Kandel, Pfalz, Bayern, Germany. iv. Georgius Michaelis Doerfler, born Abt. Oct 05, 1776 in Kandel, Pfalz, Bayern, (Bavaria, now Germany). v. Maria Eva Doerfler, born Abt. Oct 07, 1777 in Kandel, Pfalz, Bayern, (Bavaria, now Germany). 13. Catherine Frank, born Abt. 1741 in Eschbach(Erlebach? 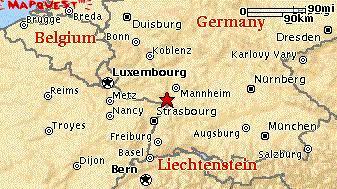 ), Pfalz, Bayern, Germany; died Dec 26, 1815 in Hayna, Bayern, Germany. 6 i. Joannes Jacobus Stritzinger, born Abt. Dec 01, 1776 in Hanya, Bavaria, Bayern, Germany; died Aug 02, 1847 in Hanya, Bavaria, Bayern, Germany; married (1) Maria Catherine Clara Metz Jan 27, 1806 in Hayna, Pfalz, Bayern (Bavaria, now Germany); married (2) Mariae Annae Wingerter Jun 08, 1807 in Hayna, Pfalz, Bayern (Bavaria, now Germany). ii. Eva Margaretha Stritzinger, born Abt. Dec 06, 1778 in Katholisch, Hayna, Pfalz, Bayern. iii. Georgius Jacobus Stritzinger, born Abt. Jan 12, 1781 in Katholisch, Hayna, Pfalz, Bayern. 14. Martini Wingerter* He married 15. Maria Eva Wingerter Jan 20, 1783 in Katholisch, Eschbach, Pfalz, Bayern. 7 i. Mariae Annae Wingerter, born Abt. Nov 17, 1783 in Hanya, Bavaria, Bayern, Germany; married Joannes Jacobus Stritzinger Jun 08, 1807 in Hayna, Pfalz, Bayern (Bavaria, now Germany). ii. Joanne Adamus Stritzinger, born Abt. Dec 11, 1790 in Hayna, now the Pfalz, Germany. 16. Conradi Doerfler He married 17. Nicolae Mueller Abt. 1737. 17. Nicolae Mueller, born Abt. Feb 06, 1718 in Kandel, Pfalz, Bayern. She was the daughter of 34. Hans Michael Mueller and 35. Maria/Anna Catharina Unknown. i. Johannes Martinus Doerfler, born Abt. Mar 03, 1738 in Kandel, Pfalz, Bayern. ii. Anna Maria Doerfler, born Abt. Oct 28, 1739 in Kandel, Pfalz, Bayern; married Andreas Ecker May 09, 1763 in Kandel, Pfalz, Bayern, Germany. 8 iii. Joanne Michael Doerfler, born Abt. Aug 06, 1741 in Kandel, Pfalz, Bayern; married Dorotheae Wittmayer Abt. 1767 in probably Kandel, Pfalz, Bayern, (Bavaria, now Germany). iv. Petrus Leonardus Doerfler, born Abt. Apr 12, 1746 in Kandel, Pfalz, Bayern. v. Eva Margaretha Doerfler, born Abt. Dec 26, 1748 in Kandel, Pfalz, Bayern; married Petrus Hott Nov 09, 1772 in Kandel, Pfalz, Bayern, Germany. vi. Maria Catharina Doerfler, born Abt. May 27, 1754 in Kandel, Pfalz, Bayern. vii. Catharina Barbara Doerfler, born Abt. Oct 29, 1757 in Kandel, Pfalz, Bayern; married Georgius Riedinger Jun 27, 1786 in Kandel, Pfalz, Bayern. 18. Mathiae Wittmayer, born Abt. Feb 20, 1704 in Kandel, Pfalz, Bayern, (Bavaria, now Germany). He was the son of 36. Joannes Otto Wittmayer and 37. Veronica Linck. He married 19. Mariae Ursulae Unknown. 9 i. Dorotheae Wittmayer, born Abt. Feb 15, 1739 in Kandel, Pfalz, Bayern, (Bavaria, now Germany); married Joanne Michael Doerfler Abt. 1767 in probably Kandel, Pfalz, Bayern, (Bavaria, now Germany). 25. Anna Maria Kuntz, born Bet. Jan 1711 - 1712 in Herxheim, Landau, Pfalz, Germany. i. George Adam Stritzinger, born Abt. Mar 14, 1735 in Katholisch, Hatzenbuehl, Pfalz, Bayern. ii. Anna Maria Stritzinger, born Abt. Feb 19, 1736 in Katholisch, Hatzenbuehl, Pfalz, Bayern. iii. Anna Maria Stritzinger, born Abt. Dec 14, 1737 in Katholisch, Hatzenbuehl, Pfalz, Bayern. iv. Nicholaus Stritzinger, born Abt. Jan 11, 1740 in Katholisch, Hayna, Pfalz, Bayern. 12 v. Nicolaus Stritzinger, born Abt. Feb 18, 1741 in Hanya, Bavaria, Bayern, Germany Birth Record; died May 17, 1821 in Hanya, Bavaria, Bayern, Germany; married Catherine Frank Jan 07, 1770 in Hayna, Bayern, Germany Marriage Record. vi. Maria Catherina Stritzinger, born Abt. Sep 22, 1744 in Katholisch, Hayna, Pfalz, Bayern. vii. Maria Eva Stritzinger, born Jan 30, 1747 in Katholisch, Hayna, Pfalz, Bayern. viii. George Jacob Stritzinger, born May 30, 1749 in Katholisch, Hayna, Pfalz, Bayern; married Maria Barbara Brauencker Abt. 1784; born 1760.
ix. Joseph Adam Stritzinger, born Aug 12, 1751. 34. Hans Michael Mueller, born Abt. 1685 in possibly Wallerstein, Schwaben, Bayern. He married 35. Maria/Anna Catharina Unknown Abt. 1711 in possibly Wallerstein, Schwaben, Bayern. i. Jakob Mueller, born Jul 22, 1714 in Wallerstein, Schwaben, Bayern. ii. Anna Maria Mueller, born Abt. Dec 29, 1715. 17 iii. Nicolae Mueller, born Abt. Feb 06, 1718 in Kandel, Pfalz, Bayern; married Conradi Doerfler Abt. 1737.
iv. Maria Ursulae Mueller, born Abt. Oct 19, 1719 in Kandel, Pfalz, Bayern. v. Joannes Jacob Mueller, born Abt. Feb 03, 1724 in Kandel, Pfalz, Bayern. vi. Franciscus Josephus Mueller, born Abt. Jan 16, 1726 in Kandel, Pfalz, Bayern. 36. Joannes Otto Wittmayer. He married 37. Veronica Linck Jan 22, 1704 in Kandel, Pfalz, Bayern, (Bavaria, now Germany). 37. Veronica Linck, born Abt. Dec 28, 1677 in Kirchen, Rheinland, Preussen. She was the daughter of 74. Tilmann Linck and 75. Eva/Euam Ex Katzenbach. 18 i. Mathiae Wittmayer, born Abt. Feb 20, 1704 in Kandel, Pfalz, Bayern, (Bavaria, now Germany); married Mariae Ursulae Unknown. ii. Joannes Georgius Wittmayer, born Abt. Aug 28, 1706 in Kandel, Pfalz, Bayern, (Bavaria, now Germany). iii. Georgius Michael Wittmayer, born Abt. Sep 03, 1709 in Kandel, Pfalz, Bayern. 74. Tilmann Linck. He married 75. Eva/Euam Ex Katzenbach Aug 19, 1670 in Kirchen, Rheinland, Preussen. 37 i. Veronica Linck, born Abt. Dec 28, 1677 in Kirchen, Rheinland, Preussen; married Joannes Otto Wittmayer Jan 22, 1704 in Kandel, Pfalz, Bayern, (Bavaria, now Germany).